Get your introduction into Crete’s underwater world without the use of Scuba gear. Discover the underwater delights of the fascinating fish and plant life of our island. We offer a snorkeling programme in which you learn the correct use of snorkel, mask, fins and wetsuit followed by a trip to one of our dive sites under the direct supervision of one of our professional team member. You may want to take the experience one step further and perhaps discover the joys of skin diving. * Weather conditions: All tours and cruises are subject to weather conditions. 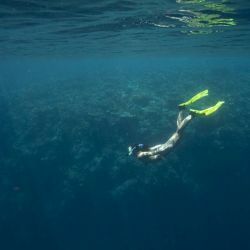 Depending on the daily weather conditions we will choose a sheltered location for the best snorkeling conditions. Discover untouched snorkeling sites that are accessible only by boat. Our boat trips are designed to make you discover the true beauty of the underwater world where you can enjoy the scenery while swimming in the crystal clear waters of Crete. We will begin our day with a theoretical lesson with the instructor explaining the basics of snorkelling, safety rules and equipment. After completing the briefing we will depart with our speed boat to one of our snorkelling sites under the direct supervision of one of our professional team member. *Weather conditions: All tours and cruises are subject to weather conditions. Depending on the daily weather conditions we will choose a sheltered location for the best diving conditions.